The recently proposed Iran agreement has created a significant amount of controversy. Much of the tone and rhetoric has been around the quality of the negotiations, and our ability to audit and enforce agreement compliance. Because of this, I’ve been reflecting on my personal experiences reviewing and negotiating information technology related contracts. My scenarios are significantly different. There are no lives at risk. My involvement has primarily been with software, systems, and communications purchases. My first exposure was at an extremely well managed and efficient nationwide manufacturer. They were a family owned company that challenged everyone to continually improve, and operated in a very lean and efficient manner. This experience provided the base foundation for my own leadership journey. Negotiate from strength. The Vice President of Purchasing (Mike) always negotiated from strength. When Mike went in to purchase materials or equipment, he knew what he needed from the deal. He was ready to walk away if he didn’t achieve this goal. I’ve heard stories of people asking for his best price, and Mike responding with his number. When they countered the offer, he’d shock them by lowering his price instead of increasing it. That dance would continue until Mike received his terms, or he would walk away from the deal. It sounds like John Kerry never went in with this attitude, or the outcome could have been much different. Be prepared to walk away. I was told of one instance in Mike's personal life where he visited a Cub Cadet dealer. Mike asked for the dealer’s best price, and apparently received it. He counter-offered a significantly lower price to start the game. The Cub Cadet salesperson went to his office and sat down at his desk. Mike assumed he was sharpening his pencil. The salesperson never came back outside, and Mike never went back in – both knew what they wanted, and were willing to walk away. If you’re too far apart on what your requirements, don’t be afraid to walk away. If Mike would have went back inside, or the salesperson came back outside, one or the other would have lost their leverage. Were our negotiators willing to use their strength and walk away? Set clear expectations. I met with Jim, the company's Executive Vice President to discuss the contract for a large ERP software purchase we were negotiating. We worked closely together with Mike to negotiate the price and terms for all technology purchases. Jim related an experience he had as an executive at a smaller airline. As he was reviewing a purchase of a multi-million dollar jet, and reading the terms and conditions, he made an odd discovery. He realized the aircraft he was purchasing wasn’t guaranteed to fly. He had done his best to improve the terms and conditions. However, this was only effective up to the point where the vendor was willing to walk away. In some cases, there was little he could do since he wasn’t negotiating from a place of power. He needed the airplane to fly passengers and generate revenue. In other situations, he was negotiating from a place of power, and was able to obtain significantly better agreements. The key, he said, was mitigating risk to an acceptable level… understanding what’s critical… and recognizing your leverage. Enter your negotiations process knowing your bottom line price for the level of service you require, each partners responsibilities, and what risks need mitigated before you can accept the agreement. Did our country do this with the treaty? Communicate clearly, and get contract clarification in writing. Ambiguous language should not exist in a contract. If there’s something you don’t understand, or that is subject to interpretation… get a concise explanation that both you and your vendor can interpret clearly included as a signed addendum. The tale about the buyer at an auction asking what to do via text when the equipment he wanted was higher than he was authorized to spend is an appropriate example. The authorization he received included “no price too much”, so he kept bidding until he won the auction. Unfortunately, so the story goes… what should have been communicated was “no, price too much” – a very different message. The company ended up going bankrupt because the added equipment expense damaged their ability to continue operations profitably. Make sure you’re communications, interpretations, and understanding with the vendor are mutual and concise. Explicit contracts that clearly outline the contract requirements do not signal mistrust, and are NOT counter to a successful vendor relationships. Quite to the contrary - they reduce misinterpretations, build trust, and become the foundation for a mutually beneficial and profitable partnership. Recognize risk and scope appropriately. Read the terms and conditions. Open source software licenses do not require monetary payment. However, some do require any vendor that incorporates this code into their product to also make it freely available under the open source license. This isn’t a good option for a vendor that markets software and makes their money by selling software solutions. Work with your leadership to identify parameters for acceptable risk, and understand these limits. There is a different level of risk purchasing a copy of Microsoft Office vs. negotiating an enterprise software agreement. Did our leadership recognize the risk and scope for the Iran deal? Be fair, and partner for success. 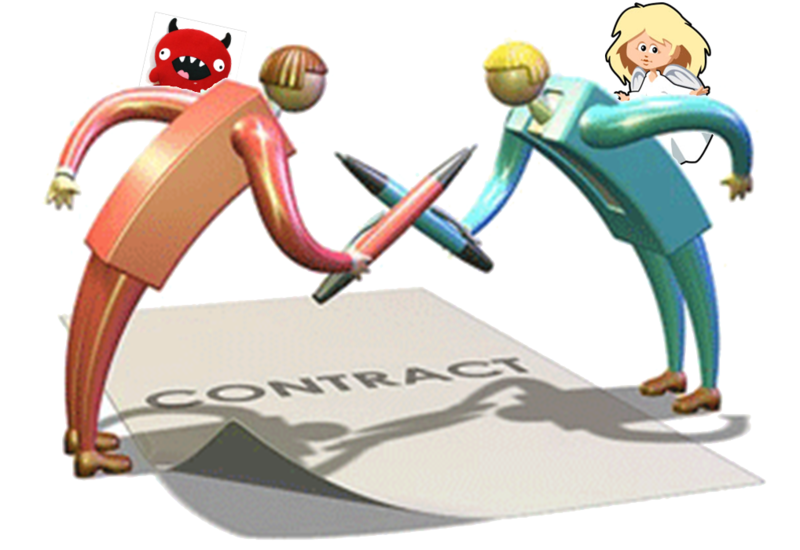 Your goal with contract negotiations is to create a fair and explicit agreement for all parties involved. There is no success in driving a critical supplier into bankruptcy. This agreement is the basis for a collaborative partnership. There may be times where you may need something expedited, and you'll need goodwill to help get things done that may be outside the scope of the agreement. If every agreement is one-sided, you'll damage any potential relationships, and that won't help your organization in the long run. If you want customer loyalty, then you must have some level of commitment with developing and establishing relationships with your key vendors. Differentiate between critical and non-mission critical agreements. Know what's critical and important for your organization. Based on your industry, the importance of a paper contract could be quite different. Treat each type of agreement appropriately. If you negotiate a paper contract for a widget manufacturer, these are likely considered expenses and probably not part of your core business unless they are required for packaging. The level of diligence may not be as important as ensuring that purchases of widget raw materials meets your requirements and is delivered on time. However, paper would be critical if you're in an industry that requires these as a raw material to deliver goods and services, such as a newspaper printer. Be explicit with context. I have one final thought on clarity in communications. Be specific and explicit in negotiations, and ensure you have spelled out the CONTEXT for each of the critical points. Do not assume context, or your contracts will be subject to misinterpretation and miscommunication. 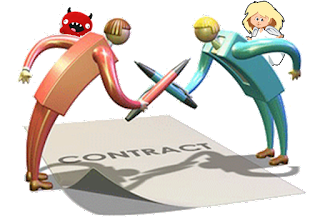 I thought I’d share some of the my thoughts on contracts review and negotiations. So, don’t be afraid to work hard and get your hands dirty. Always take the time to climb up to the top of the mountain, reflect, and look out on the horizon to survey the landscape. From the mountain top, we can get perspective on our progress, identify threats and opportunities, adjust our processes and direction, and be proactive. Go climb your mountain, survey your landscape, and adjust as appropriate. This journey is easier if you find a great mentor - mine was "Jim". Go find your "Jim"! I hope you enjoyed reading this as much as I enjoyed writing this entry.